Maximum capacity and exceptional durability from this heavy duty powerhouse. Confidently staples up to 210 sheets of 20 lb. paper! Metal construction for years of superior performance. Perfect alignments with precision adjustment guide. 2-1/2" throat depth for enhanced control and flexibility. Soft feel materials on handle for added comfort. Uses Swingline series #353XX heavy duty staples: 1/4", 3/8", 1/2", 3/4", 15/16". Swingline Heavy Duty stapler is perfect for lots of papers where the smaller stapler couldn't even think about going through. We had an older model for years that was finally worn out from changing out the staple sizes. We have been well satisfied with these Heavy Duty Staplers. This item is easy to use and meet my expectations. This product is easy to use and lives up to my expectations. i had it for a few years and recoomend but a bolt came loose somewhere and now it needs to be fixed. in the meantime it last for 3 1/2 years before it broke. Using the correct Swingline staples makes this stapler surpase expectations with no jams and no wasted time. ALWAYS purchase recommended product. Stapling plate broke a couple of times, but having it replaced. Welcome to MyBinding video. 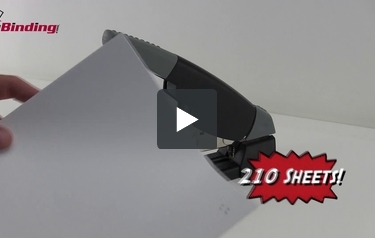 Let's take a look at Swingline's High Capacity Heavy Duty Stapler. You get maximum capacity and exceptional durability from this heavy duty powerhouse. It has a precision adjustment guide that ensures exceptional control and consistency and its all metal construction for years of superior performance. The leverage makes easy to use incredible and it can punch up to 210 sheets of 20 pound paper in a single punch. Clearing staple jam is with access right in the front. Loading the staples is simple and straightforward, pull out the back, slide the staplers in, put the back, back on and you're all set to go. That's it, that's Swingline High Capacity Heavy Duty Stapler. For more demos, reviews and how to's, check out MyBinding.com. We have a Heavy Duty Stapler 90002R and the plate broke, can we get e replacement plate? Thank you for your question. Unfortunately the manufacturer does not stock replacement parts for the Swingline High Capacity Heavy Duty Stapler. What is the Mfr. limited lifetime warranty? The limited lifetime warranty protects against original defects in material or workmanship. If the product should fail to perform for either of those reasons, the stapler can be repaired or replaced at no charge within 45 days of receipt of the defective product. We have tried to open the area where we load the staples and followed the instructions but it will not come out. Any suggestions? To remove the back gray piece, you may need to apply a bit of force when pushing it in and then lifting out. I want to pull out the existing staples and switch to a lighter load staple, but I can't get them out of the stapler! How can I do this? Once you remove the gray plunger from the back of the stapler, the staplers should slide out. Do the Models # S7090002 & S7039005 require cleaning or maintenance? Please double check that you are using the correct staples for the sheet counts you are using. We offer different sized staples based on the sheet count for these staplers. If this is not the issue, please let us know. the grey button in front what is it for? Open & close what??? The gray button on the front is for jam clearing. It should push down, and then the front plate of the stapler will swing open - this should release any jammed staples. It can be a little tough to push down, but if you're unable to get it to move, try opening the back of the stapler (as if you were going to reload the staples) to release the pressure of the spring inside - that may make it easier to open. What staples do I use? This stapler works with the S70353XX series. You can choose your leg length/staple size based on how many sheets you would like to staple. Unfortunately, this stapler does not open for tacking. We do offer other staplers that open for tacking. You may find those under the Desktop Staplers tab. How do I add staples? You will need to squeeze the gray area of the stapler in the back and lift up that segment in order to pull it out of the back of the stapler. Can I purchase a replacement "anvil" for my H.C. stapler? We unfortunately do not sell replacement parts for these staplers separately. I have replacement staples. How do I open stapler to fill staples? Can I order a replacement for the removable part that is taken off to refill the staples on the 210 sheet stapler?? Unfortunately, we do not sell the parts separately. You can use item #S7090009 Light Touch Heavy Duty Staples for this product. They can be ordered off of our Web site: www.swingline.com. In order to close the jam clearing mechanism, please close (push) the metal part in. Then you can slide it upward until it locks. How do I put new staples in my90002? Have not used for a while.